‘You’ll phone us every day,’ Sunny’s dad said, squeezing her against his chest. She could feel her hair vibrating where his mouth rested on the top of her head. In this series, Keris Stainton presents the teenagers of today, writing about their hopes and dreams as well as the difficulties they face in life, without making a big deal about them. I really enjoyed this book. 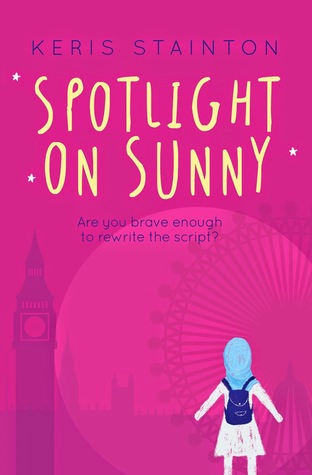 I loved the multicultural feel to it and the fact that the main character, Sunny was a Muslim.This author is waving the flag for a new generation of diverse main characters, by showing how individual and unique each teenager is, celebrating their differences rather than ridiculing them. I know very little about life as a Muslim, so it was extremely interesting to read about the customs and routines of a British Muslim teen. Sunny’s parents are quite strict about her upbringing, and Sunny embraces their views rather than rebelling against them. She has strong religious beliefs and knows exactly what she wants out of life. She comes across as a wonderful role model and a well adjusted teen. It was fascinating to watch her blossom on her first trip away from home. I haven’t read the first book in this series, Starring Kitty, but I will definitely be reading it soon. A fantastic portrayal of British teens.